Seventy years ago, social and political life were bound together in a way difficult to envisage now. The Season – those few summer weeks of hectic and formalised gaiety involving all those ‘in society’ – brought together not only influential people in that society but also those in the higher reaches of Government. The Prime Minister, Neville Chamberlain, chaperoned his debutante niece to weekend parties at Cliveden, where the gust list often read like an unofficial ambassadorial get-together, Cabinet Ministers encountered diplomats, newspaper proprietors or the heads of the armed services at the balls of the great hostesses. The intimate picture of the day-to-day events in this doomed world painted here draws on the writings and recollections of those who were there and provides an unsurpassed characterisation of England in 1939 – the conventions of fashion and behaviour, the position of women, the fetishes, beliefs and taboos of the day. As the hot summer drew on, the newspapers were filled with ever more ominous reports of the progress towards war; the telegraph wires buzzed with frantic diplomatic and political activity, mothers were issued with gas masks for their babies and barrage balloons, slit trenches and gun emplacements dotted every large city. There was nothing to do but wait – and dance. The last season of peace was nearly over. This was second in the BBC’s top five historical paperbacks of the year and in the Times bestseller list. Anne de Courcy provides a fascinating window on the frivolous social but grave political world in the months before the outbreak of the Second World War. Written with a light touch and an eye for the ridiculous, yet also succeeds in creating a genuine sense of unease and impending doom. 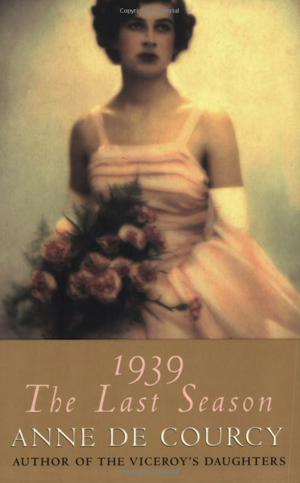 The book is a skilful weaving of the last flutter of Thirties’ society with the political events leading to war. Vividly paints the events, social and political, of those times. It is a well-written, amusing and well-researched book about a generation brought up to believe that there would never be another war by parents who remembered 1914-18 and its horrors. De Courcy’s fascinating narrative switches between domestic concerns, ranging from country-house fare to patent medicines, and the approach of would-be gate=crashers across the Channel.